And I’m not talking about just any old egg. These are special eggs. Goose eggs! 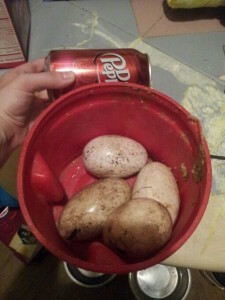 I got a text from our daughter Saturday evening that the geese had laid eggs. I asked her to send a picture. This is what I got (I’ve got her trained pretty well, she used the pop can to show size ratio, now if only she’d cleaned out the bucket first). They sure were cute. Now, I can walk out and see a beautiful creature, but they are still noisy, and scary (they hiss really well). If you remember, I had geese as a child and still have flashbacks of being chased by geese as tall as I was! We asked her to watch for more eggs the next day and take a picture of them before she picked them up. I had pulled the hog panel enclosure out before I left for the weekend so they could get to more grass, which left their water dish was a bit further from the fence than it usually is. They chose that spot to lay their eggs. Maybe she (they?) felt that was a safe place with a ‘wall’ since they are pretty exposed in the enclosure. 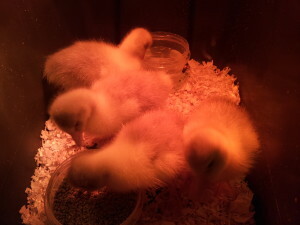 I keep saying ‘they’, but I don’t know if it’s just one laying or more. Now that we are having daylight in the morning before I leave, I’ll have a better chance to observe behaviors. 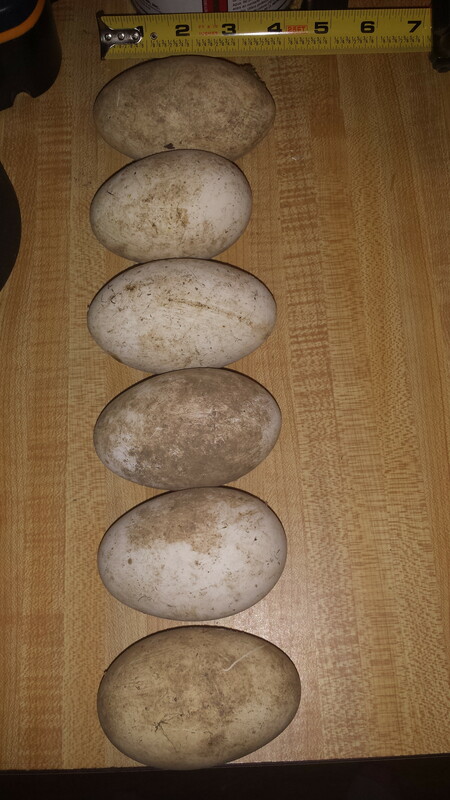 For now, I’ll assume more than one is laying due to the size differences in the eggs. I honestly think we only have one gander based on their sizes and description out of the book American Standard of Perfection 2010. The eggs are huge. I seriously have never seen an egg so big. I hear they are amazing for baking and custards, and while I am sure the eggs weren’t there when I left Friday morning, I don’t know that I can eat them just yet. 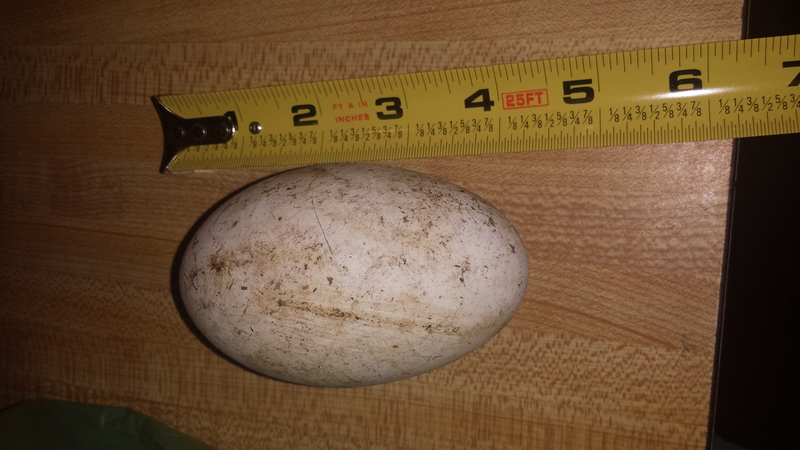 I’m no expert on goose eggs, but from what I’ve read, the goose will lay 12 to 15 eggs and then go broody. Would be nice to know absolutely how many geese and how many ganders we have. If the eggs aren’t fertilized, I’d be much more inclined to use them. At this point, I think Barbie and Abraham will enjoy some scrambled goose eggs with their dinner tonight. The eggs themselves are very heavy compared to the chicken eggs. I had to pull out the little scale and weigh them. And then the ruler to measure them. I’m kind of a nerd that way I guess. Goose eggs rock! They are BIG. 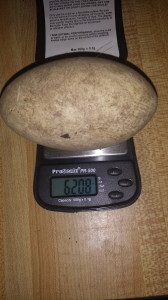 Yokes are big as well and why they are so prized. As for fertilized or not….why do you want unfertilized? Fertilized are much more nutritious. Those shells look pretty obscure, but chicken eggs you can tell holding up to a light and looking for the little “plug”. Either or, they can be thankfully and blessedly eaten. Congratulations on your big eggs and MANY more eggs in your future with the upcoming chicks! Thanks Tom! I may be a farm girl, but I’m still a bit squeamish about certain things…eating fertilized eggs is one of my quirks. I did make them for the pigs and the yolks were huge. I still have much to learn, but I think we will see if anyone is interested. 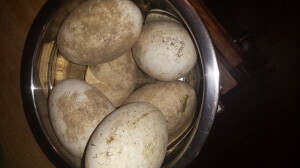 There were 4 eggs when I got home last night and 1 more this morning, but they are leaving them uncovered now so just going to keep watching.